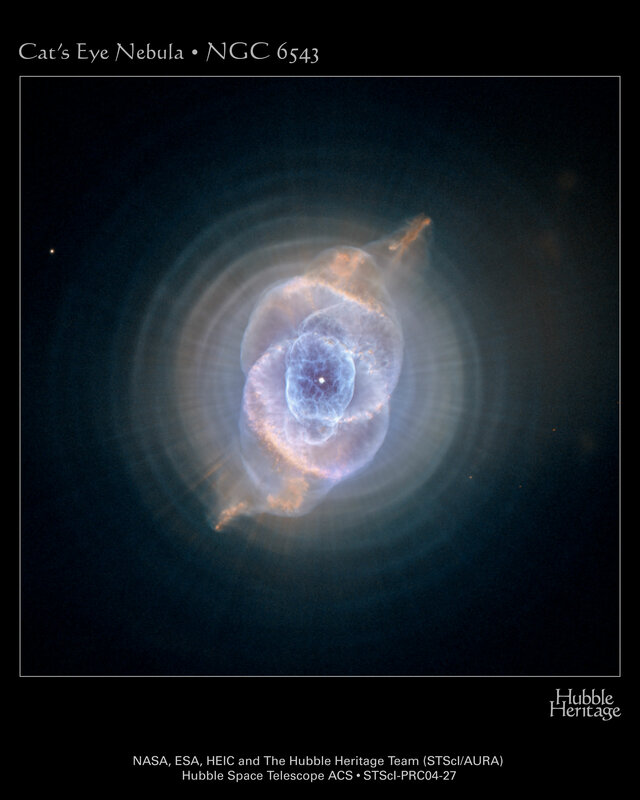 Hubblesite.org: The Cat’s Eye Nebula, one of the first planetary nebulae discovered, also has one of the most complex forms known to this kind of nebula. Eleven rings, or shells, of gas make up the Cat’s Eye. We recently checked out Supernova 1987A. If you remember, I told you that when massive (8 times the mass of the Sun or greater) stars die they explode in a supernova and leave behind either a neutron star or a black hole, surrounded by a supernova remnant. When a low mass star (less than 8 times the Sun’s mass) dies, it leaves behind a white dwarf and a planetary nebula. An example of which is shown above, the Cat’s Eye Nebula (also designated NGC 6543). 4 or 5 billion years from now, our own Sun will undergo this very same process. Perhaps our distant ancestors, or even members of an alien species, will look towards the vicinity of our former home in the galaxy and capture an image just as beautiful.